Now that spring is creeping up on us (hard to believe with so much snow in some places!) the rain is going to be setting in really soon. And with rain comes a lot of bored kids around the house. In our house rain generally means no backyard time, no walks, no playing in the sandbox. Even the dog refuses to step outside. And depending on how your internet and cable is set up, it can also mean no games or curling up for a movie! If you are creative you can come up with a ton of different ways to have fun. Shaving cream paint is one of our daily favorites (rain or shine!) or you can try your hand at colored spaghetti or oobleck. I also created a quick and easy In House Scavenger Hunt that you can download, print off, and get to the fun! This is good for kids of all ages. If you have an older kid, just hand them a pen and let them go. 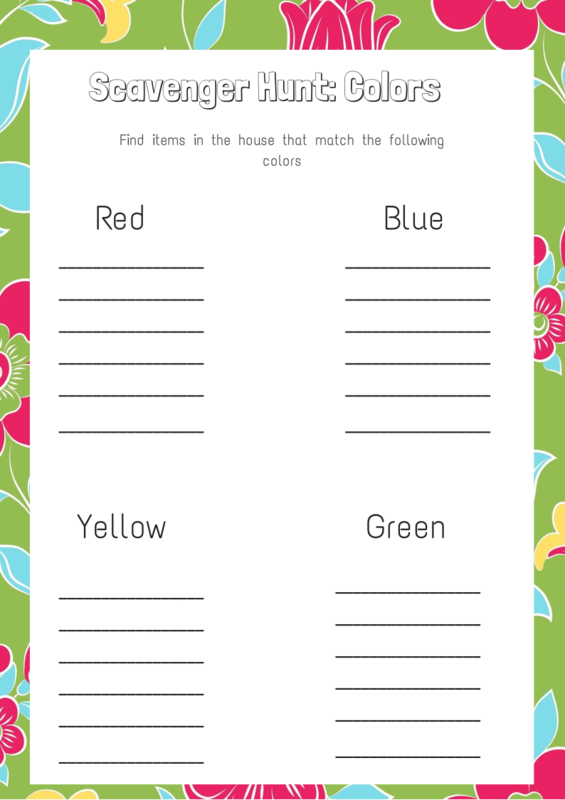 If you have a younger kid, you can use the secondary printable to just look for any objects around the house that have a specific color and then write them in. Now you can also use these printables for those days your kids get stuck at home from school being sick, but not sick enough to be in bed all day. Do you have something you do with your kids when the weather is no good outside? I love this! I was just talking the other day about how we’ve got the middle of winter blues. I think this could apply to that as well. We love scavenger hunts. It is one of Zoe’s favorite things to do when we can’t get outdoors, which is often lately. I have found rainy days actually are more of a bonding time for our family. We rent a movie or play some scrabble, even getting out of the house for bowling is better than being home during crummy weather. Thanks for the printable! LOVE the idea of a house scavenger hunt! Never thought of that! Thanks for the printable! We enjoy playing with our Legos and reading books on rainy days. I am going to try some of your shaving cream paint though, it looks like fun! Sometimes, indoor days can become frustrating. Thanks for the tips for keeping them busy and engaged. Love the printable, and the idea about the shaving cream paint! This is such a great idea! Kids always love scavenger hunts. What a fun idea! Not too many rainy days here but plenty of snow ones! This sounds like a fun idea. Especially for my 6 year old. He would think it was a lot of fun. we usually watch movies and color when we have rainy days. and we like to to do puzzles and play board games and dice or card games. Our favorite rain activity is actually – playing in the rain!! 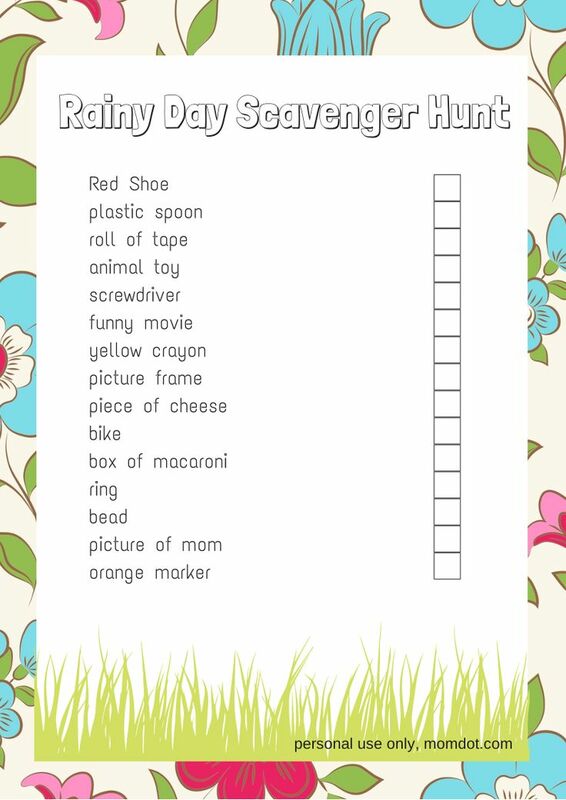 But I LOVE the idea of this scavenger hunt – I think I may download these to use at our next playgroup meet up – what fun! And thanks for the fever info too!